PRP or Platelet Rich Plasma for hair loss is becoming increasingly popular in Guwahati, Assam. PRP is done in Arogyam Hair Transplant Clinic using the best anticoagulants and imported vials to produce L-PRP which is very effective in many types of hair loss. Read on to know more about PRP in Guwahati, Assam. PRP is platelet rich plasma; in PRP, a solution of 1 ml of blood plasma which is very rich in platelets is injected into areas of hair fall and hair loss to help with hair loss. It is also used in other conditions like sports injuries and in orthopaedic conditions. In PRP, 10 ml of blood is drawn from the patient and then subjected to a special purification process so that 1 ml of purified plasma is finally extracted from the blood. This plasma is very rich in platelets. Platelets are a type of blood cell which are primarily involved in blood clotting. They also contain a lot of growth factors and these growth factors are released when the PRP is injected into the scalp and it is these growth factors which stimulate hair stem cells. PRP became famous when it was used for sports injuries by many famous atheletes like Tiger Woods and Rafael Nadal. It helps in early healing of sports injuries. PRP is also used in many Orthopaedic conditions like Osteoarthritis where it helps in recovery from the disease condition. 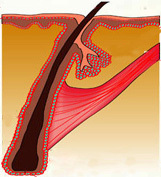 PRP has been used in hair loss since a long time. It is used in various conditions like Alopecia Areata, Androgenetic Alopecia or Male Pattern Baldness, Telogen Effluvium or increased hair loss, hair thinning and breaking, etc. Androgenetic Alopecia or Male Pattern Baldness is the common form of baldness that we see in males. PRP helps in this by decreasing the hair loss and increasing hair longevity, growth and thickness. Thus it helps in recovery to some extent in baldness and is specially helpful in decreasing further loss. Alopecia areata is an autoimmune condition in which a circular area of hair loss is formed, PRP helps in this by helping in early recovery. Telogen Effluvium is a condition when there is increased hair loss due to various factors like poor nutrition, pregnancy, fever, hypothyroidism and also other unknown causes. PRP helps greatly in this by decreasing hair loss and helping in early recovery. Increased Hair Thinness and breaking is also helped with PRP as it increases the hair diameter and also makes hair stronger thus preventing breaking. There are several types of PRP like Pure PRP, L-PRP, PRF and L-PRF. Arogyam Clinic uses L-PRP. Arogyam clinic uses the latest technique of L-PRP using imported vials and with the latest dedicated centrifuge technology. Generally, one session per month for three months is required in 1 year, which means three sessions in a year. But even a single session is very helpful and helps in all these conditions. The procedure takes about 1 hour from start to finish. Cost in PRP per session is Rs 5000 in Arogyam Hair Transplant Clinic. This includes everything and there are no other charges. Prior booking has to be done for the procedure. Please call at 7637089211 / 8811077011 for further details and to book an appointment.